The QR Code…or the Snap Tag? QR Codes, or quick response codes, gained popularity quite quickly and generated buzz especially when companies like Best Buy and Macy’s started using them. QR codes are so simple and affordable for companies to integrate into their campaign. Consumers then use their smartphone to scan the QR Code which took the consumer to either the company’s webpage or a special microsite. It’s been hard for consumers to take to them. They require a smartphone AND a special app to scan the barcode. They haven’t been adapted as mainstream by companies either. So is there an alternative to the QR Code? Now there is…the Snap Tag. The Snap Tag was developed by Spyderlynk. It turns any logo or recognizes symbol into an interactive tool for mobile marketing. The sample from Spyderlynk below illustrates the Snap Tag. The Code Ring around the logo or icon is what is scanned. But again, consumers must use a “special app” to scan the Code Ring that will take you to the website or desired response. But…here’s where they Snap Tag really differs from a QR Code. You can SNAP a picture of the Snap Tag and TEXT the code to a special short code and you will receive a text back with the link. This is the biggest difference. 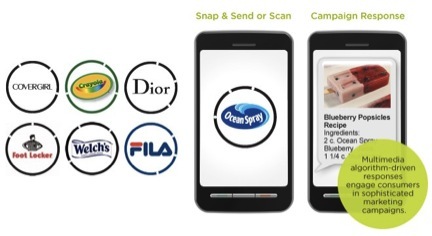 You can even instruct what specific action you want the consumer to take with Snap Tags.